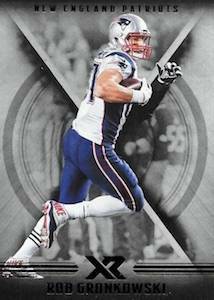 Marking its overall collecting premiere, 2017 Panini XR Football is a new addition to the card brand's growing NFL lineup. Within each hobby box, collectors can find two autographs and one relic card. With a distinct x-shaped design, the standard base set is joined by Xtreme Rookies and Gilded Greats inserts. Each hobby box should deliver at least one insert to go along with four numbered parallels and two rookies, all with a print run under 299 copies. 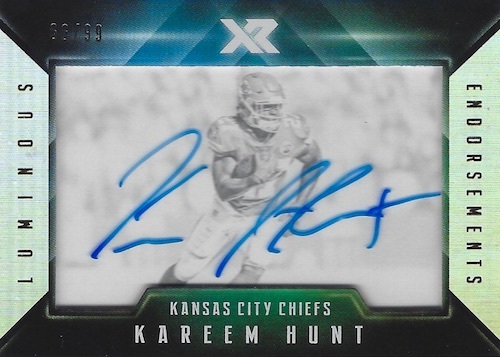 Naturally, the 2017 Panini XR Football checklist also packs in the hits. Averaging two signed cards per hobby box, the autographs include several different themes. 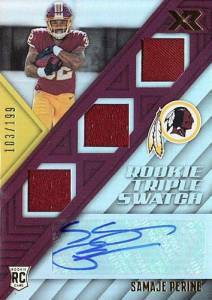 Based around the incoming class, the Rookie Triple Swatch Autograph and Rookie Jumbo Swatch Autograph cards are each limited to 199 copies or less. Amplifying the auto-relic coverage, Dual Autograph Swatches and Triple Autograph Swatches inserts, numbered to 20 or less, put first-year players with established stars. There are also Luminous Endorsements cards (#/99 or less), which incorporate a shadowbox design. 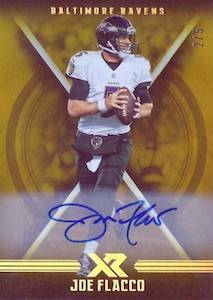 Providing another hit in each box are the 2017 Panini XR Football memorabilia relics. 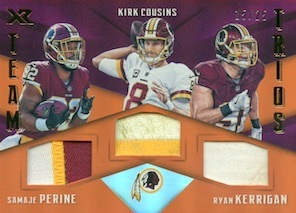 This includes Maximal Materials, NFL Shields, Rookie Jumbo Materials and Team Trios Materials sets that are numbered to no more than 99 copies. 2017 Panini XR Auto Orange #151 Raekwon McMillan rookie auto #6 49 dolphins! 2017 Panini XR Rookie Patch Autograph James Conner Pittsburg Steelers 1 1! 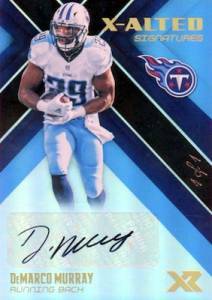 Kenny Golladay 2017 Panini XR Rookie Autograph Luminous Endorsements!! PARALLEL CARDS: Red #/299, Blue #/199, Orange #/75, Gold #/10, Green #/5, Black 1/1, Printing Plates 1/1. PARALLEL CARDS: Red #/75 or less, Blue #/49 or less, Orange #/25 or less, Gold #/10 or less, Green #/5 or less, Laundry Tags 1/1 (Glove/Hat/Jacket/NFL Shield/NFLPA/Swoosh), Prime Football 1/1, Super Prime 1/1, Printing Plates 1/1. 58 cards. Shop on eBay. PARALLEL CARDS: Gold #/10 or #/5, Black 1/1. All subjects not found in Gold parallel. View specific options with the spreadsheet. 49 cards. Shop on eBay. PARALLEL CARDS: Orange #/49, Black 1/1. *Donnel Pumphrey only in Black parallel; Jordan Willis only in parallels. PARALLEL CARDS: Red #/75 or less, Blue #/49 or less, Orange #/25 or less, Gold #/10 or less, Green #/5 or less, Glove Super Prime 1/1, Hat Super Prime 1/1, Jacket Super Prime 1/1 (No Curtis Samuel*), Laundry Tags 1/1 (NFL Shield/NFLPA/Swoosh), Prime Football 1/1, Super Prime 1/1, Printing Plates 1/1. 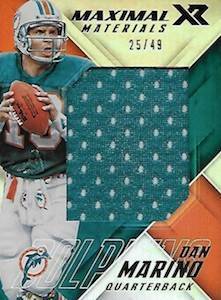 PARALLEL CARDS: Red #/75 or less, Blue #/49 or less, Orange #/25 or less, Gold #/10 or less, Green #/5 or less, Laundry Tag 1/1, Logos 1/1 (Brand/Football NFL/Glove Brand/Glove Team/Hat Team/Team), Super Prime 1/1, Printing Plates 1/1. PARALLEL CARDS: Gold #/10 or #/5 (No Brees, Sanders, Bradshaw*), Green #/5 or #/3 (No Crowell, Brees, Sanders, Bradshaw*), Super Prime 1/1 (No Crowell*), Tag 1/1, Printing Plates 1/1 (No Crowell*). 20 cards. Serial numbered #/10. PARALLEL CARDS: Gold #/5 (No card #8*), Green #/3, Super Prime 1/1, Tag 1/1, Printing Plates 1/1. PARALLEL CARDS: Gold #/5, Green #/3, Super Prime 1/1, Tag 1/1, Printing Plates 1/1. 20 cards. Serial numbered #/99. Shop on eBay. PARALLEL CARDS: Blue #/49, Orange #/25, Gold #/10, Green #/5, Black 1/1, Printing Plates 1/1. PARALLEL CARDS: Gold #/10 (Holmes, Flacco, Sherman, Long - #/5*), Black 1/1. PARALLEL CARDS: Blue #/49 or #/25, Orange #/25 or #/10, Gold #/10 or #/5, Green #/5 or #/3, Black 1/1. PARALLEL CARDS: Blue #/49 or #/25, Orange #/25 or #/10, Gold #/10 or #/5, Green #/5 or #/3, Super Prime 1/1, Tag 1/1. 40 cards. Serial numbered #/49. Shop on eBay. PARALLEL CARDS: Red #/25, Blue #/15, Orange #/10, Gold #/5, Green #/3, Black 1/1, Printing Plates 1/1. 40 cards. Serial numbered #/75. PARALLEL CARDS: Blue #/49, Orange #/25, Gold #/10, Green #/5, Super Prime 1/1, Tag 1/1. 40 cards. Serial numbered #/99. Shop on eBay. PARALLEL CARDS: Blue #/49, Orange #/25, Gold #/10, Green #/5, Black 1/1. PARALLEL CARDS: Blue #/49 (No cards #9, 14, 16, 28, 30*), Orange #/25 or less, Gold #/10 or #/5, Green #/5 or #/3, Super Prime 1/1 (No card #4*), Tag 1/1 (No card #/4*). PARALLEL CARDS: Gold #/10 or #/5 (No Moss, Johnson, Sanders*), Black 1/1. 40 cards. Serial numbered #/99. Some of the teams are basically barely repped. Very well-executed theme and design. Lots of unique cards covering a wide range of rookies and vets. 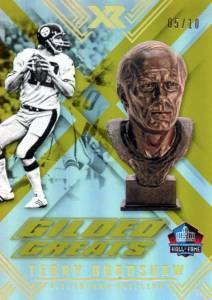 Hoping Panini will bring back this product, and maybe even with more hits (for a higher price, of course). Would definitely recommend for the price. 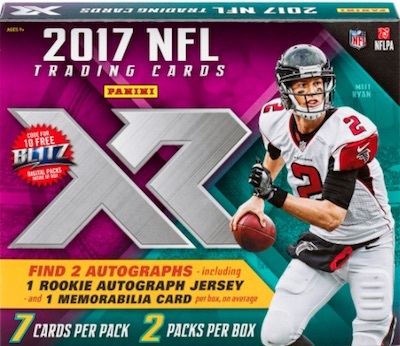 2017 Panini XR Football Hobby Box - Factory Sealed!